Over the years great franchise companies have become more selective in whom they grant franchises to. Strong franchisors know the qualities of successful franchisees and will watch for them as they recruit new franchisees into the system. They might do this through interviews, aptitude tests and/or observation. Franchisors recognize that no one is perfect. They are motivated to identify your strengths and weaknesses so that they can guide you to fully utilizing your strengths and coach you to hire employees who will offset your weaknesses. Below are the 10 qualities that are most commonly found in successful franchisees. Rate yourself and see how you compare. Ownership, Accountability and Responsibility. Successful franchisees take ownership for their own success. They rely on the franchisor for support and assistance. They will seek input possibly from the franchisor and other franchisees, but know that their success is dependent upon them. Successful franchisees will hold themselves accountable through business plans and goal setting. If things are not going according to plan, successful franchisees take responsibility and make adjustments to get things back on track, rather than placing blame, making excuses or being in denial. Willingness to follow a system. Successful franchisees are committed to following a system. They recognize that a brand is created through consistency and that there is a need for all franchisees to follow the franchise business model. Some individuals are too entrepreneurial, not willing to adapt but instead want to do their own things. These individuals are best to open an independent business. Successful franchisees are team players, knowing that the brand is created through uniformity and the customer having a consistent experience, no matter which location they are at. Customer service focus. Building a profitable business is all about getting and keeping customers, while maintaining adequate margins. Successful franchisees have a high desire to provide exceptional customer service. This is how you build a long term viable business. It is far easier and more impactful to have existing customers coming back more often, buying more products and services, than trying to get new customers. Leadership/ Management aptitude. Successful franchisees have the ability to get things done through others. Although the franchisor can teach you management skills, it is your attitude towards employees that will make a difference. Successful franchisees see employees as a valuable asset rather than an expense. They will communicate to employees what is in it for them. Their employees are treated as individuals, with respect and trust. The successful franchisee inspires others to a common vision. Optimistic outlook. Business will always have ups and downs. You will be faced with challenges (i.e. employees not showing up for work, running out of inventory, etc.). Successful franchisees don’t let these issues take away from their long-term positive outlook. They always see the glass half full, not half empty. They respond to the issues knowing that it is simply a small speed bump and not an insurmountable mountain. Family support. Over the years franchisors have learned that there is a high correlation between business success and the franchisee having family support. If both spouses are active in the business there is an even greater probability of success, although this is often at the expense of work and family life balance. Franchisor will look favorably on the fact that both spouses are active in the franchise review process. Realistic expectations. Initially starting a business may require long hours. Successful franchisees recognize that starting business will require a lot of long hours and hard work during the initial start-up phase. It may take one to two years to build the business to solid profitability. Successful franchisees are not expecting to get rich overnight. They may not get rich at all. Instead, they are going into the business knowing that the business will provide a great income and will allow them to build long-term equity. The franchisee will reap the benefits of independence, flexibility and pride of ownership. Drive, high attainment. Successful franchisees have a habit of setting goals and working hard to achieve them. Ideally the goals are written. They are fully committed and focus on the achievement of their goals. Despite obstacles and challenges, the successful franchisee does not give up. They know that every problem has a solution, every solution may have a complication but every complication has an alternative. A passion for the brand. Successful franchisees are excited about the brand that they have chosen. They are constantly promoting the brand in the community and with friends. They are excited about getting up in the morning and going to work. They strongly believe in the products and services that they offer. Financial ability. A common reason why businesses fail, often within the first two years, is because they are undercapitalized. Successful franchisees have the financial investment required to invest in the business initially as well as provide for the working capital needs during the start up phase of the business. The successful franchisee is not borrowing all the funds and having all the profits going towards servicing debt, but instead have anywhere from 30 to 50 percent unencumbered funds, or cash, to invest. Depending upon the industry, franchisors will look for certain experience and skill sets. It might be industry specific knowledge, sales skills or management experience. But often these skill sets can be taught. More frequently it is an attitude that makes the difference and it is attitudes that are reflected in the majority of the ten qualities outlined. Franchisors will actively look for the right attitudes when selecting their next franchisees. Most successful business owners will have a variation of these ten qualities and character traits. It is what has made them successful. How do you compare? No person is perfect but if you have the majority of these qualities, you have what it takes to be successful in your own franchise. Set yourself a goal to find the right business that you can be passionate about and precede with confidence knowing that you have what it takes to be successful. Wayne Maillet Headshot 2Wayne Maillet is President of Franchise Specialists, a franchise consulting firm based out of Vancouver. Wayne Maillet is a leading Canadian franchise management consultant with over 20 years of practical experience in all aspects of franchise operations. Prior to consulting Wayne Maillet worked for the corporate offices of such franchise companies as Keg Steakhouse, Uniglobe Travel and Realty World. Although the industries were different, the principles, challenges and opportunities of franchising were found to be the same. Wayne Maillet is an active member of the Canadian Franchise Association. Respected within franchise circles, he brings a realistic, practical understanding of business and franchising. Wayne Maillet has spoken across Canada on how to franchise your business, written several articles and is often quoted as an authority in franchising. You have been granted a franchise. It is an exciting day as you sign papers and begin looking forward to a promising future. The next morning, however, the excitement has diminished—now what? Starting a new business, even within a proven franchise system, requires a lot of work. While it may still be months before you open for business, there are still many tasks to be accomplished before that day comes.The good news is you are not alone. As a franchisee, you benefit from the support, resources and knowledge of your franchisor as you work towards your grand opening. Experienced franchisors will provide you with advice on best practices and point out, where possible, anticipated hurdles and how to overcome them. (In fact, franchisors typically provide a start-up checklist to ensure no detail is overlooked.) The following is a list of some common tasks you can expect to tackle between being granted your franchise and celebrating your grand opening. Once you have been granted a franchise, one of your first tasks will be participating in initial training, typically conducted at your franchisor’s head office. This provides you with the knowledge and skills to duplicate the franchisor’s proven business model and replicate the customer experience. Training is the foundation of a strong franchise system. Successful franchising is all about duplication and consistency. A brand is strongest when the customer has the same experience each time they visit a franchised location, no matter what time of day or location they choose. During training, you must set aside any preconceived ideas of how the business should be run. Stay open to learning the new methods to which you are introduced. This can be difficult, especially if you have previous entrepreneurial experience. However, your franchisor requires you to learn and adapt to their method of doing business in order to preserve the brand—and better ensure your future success. Unless your franchise is home-based or mobile, one early step will involve finding a location out of which you will operate your business. In many cases, you’ll derive a large percentage of revenues by simply having a location with high visibility and easy customer access. The right location can launch (or severely limit) your success. Before beginning your search, check with your franchisor to see whether any pre-approved locations exist, as this could save you a lot of time and effort. If this is not an option, use a commercial realtor or professional who specializes in retail leases to assist you with your search. Once you find a franchisor-approved location, be sure to have all final lease documents reviewed by a lawyer prior to signing. ● safe food handing certificates. When determining what licenses you require, a great place to start is the BizPal website (www.bizpal.ca). This government-run resource offers information on permits and licenses across Canada. An experienced local lawyer, accountant and/or contractor can also help you comply with all federal, provincial and municipal laws. A lawyer is an important member of any franchisee’s team. You have already had your lawyer review your franchise agreement prior to signing; now, there are other legal matters to deal with. For example, you may want to incorporate a company through which to operate your new franchise. If you have shareholders or partners, you will want to have a shareholder or partnership agreement written up. In addition to these tasks, your lawyer can also be a valuable resource when it comes time to review your lease, insurance papers, general contractor agreements and any other legal documents that come across your desk as you work to establish your new business. Once you have a location and an established business address, you should set up a bank account, order cheques and organize credit card accounts and acceptance. Be sure to set up a line of credit to cover your working capital needs once the business is open. Good bookkeeping will allow you to effectively manage your business. There are several effective accounting software systems on the market to help make bookkeeping easier. Ask your franchisor for a typical chart of accounts and what software they recommend or require. Depending on the business and your personal strengths, you may want to hire a bookkeeper and/or contract an outside company to handle payroll. While it is tempting to save money by doing everything yourself, your time may be better spent building relationships with customers or managing your employees, rather than sitting in the office trying to get your books to balance. ● theft or employee fraud. As you will be making tenant improvements and stocking inventory prior to opening your business to customers, be sure your insurance coverage commences immediately upon taking procession of the premises. In your franchise agreement or the franchisor’s operation manual, there will typically be specific insurance requirements you are obligated to get from insurance providers. In some cases, a specific insurance provider will be mandated as a supplier in order for franchisees to take advantage of group buying power. An insurance professional can also offer detailed advice according to your specific needs. Some franchisors may build out stores through the franchisor’s in-house building department or an approved general contractor. Others may require you to build out the location yourself by hiring your own contractor. In these cases, ask the franchisor to recommend a builder who has worked on stores for other franchisees. You want to select someone who is reputable and can get the job done on time, on budget and within the franchisor’s specifications. Always check references and visit locations the contractor has built in the past. Whether it is through a general contractor or your franchisor, be sure to get specific quotes for buildout costs—in writing. In any construction project, there can be unforeseen costs and delays. While unpredictable, these inconveniences should still be addressed before work begins. For example, discuss conditions that must be met if costs exceed a certain percentage of the original quote (e.g. a 10 per cent variance). You may be able to negotiate a deal in which such overruns become the general contractor’s responsibility or ensure some compensation for you if delays occur. Throughout the entire process, your franchisor will be overseeing the plans and construction to ensure the finished location conforms to established specifications. While you may be able to provide input, your franchisor will make the final decisions when it comes to brand consistency. It is important for you to recognize and respect the franchisor’s experience in these matters. In most cases, there are valid reasons and a solid strategy behind all design decisions. The furniture, fixtures and equipment you will need to efficiently operate your business are also usually clearly defined by the franchisor. Head office will provide you with an approved list of any items you require, as well as contact information for approved suppliers. If you have any questions or concerns, ask your franchisor support representative. As you receive items, keep track of all warranty and contact information, in case issues arise in the future. You may be tempted to seek out better deals in an attempt to save money; in fact, you may even come across alternatives that appear to be cheaper. However, you must recognize your franchisor has set specifications on furniture, fixtures and equipment based on experience. As such, saving money in the short term may cost you substantially more over time. Equipment, furniture and fixture purchases cannot be evaluated merely on initial costs. Other factors—such as functionality, speed of warranty service, esthetics and durability—must also be taken into account. Unless you are running a one-person operation, recruiting employees will be an important part of starting your business. Selecting the right staff will dramatically improve your chances for success. Your staff requirements will vary depending on the type of franchise you have purchased. A full-service restaurant (FSR), for example, will require many more employees than a small business services operation. Many franchisors will help you hire and train your initial staff during the start-up phase of your business. Despite the assistance, these are ultimately your employees; it is your responsibility to cultivate and maintain positive long-term working relationships with each member of your staff. Your franchise agreement will typically further clarify that as a franchisee, you are responsible for all decisions related to hiring, firing, training, wages, hours, supervision and discipline. As a result, it is important to be aware of any employment standards and labour laws applicable in your jurisdiction. Inventory is typically the last thing to be stocked prior to opening. That said, you should co-ordinate supplier credit approval well before inventory delivery. Depending on the type of business you are running, there may be substantial lead time required from ordering to delivery. Research these timelines well in advance to prevent any opening delays. Approved suppliers have been identified, investigated and accepted by the franchisor as meeting its brand and quality standards. You are typically required, under the terms of your franchise agreement, to purchase only from these suppliers. While this may seem limiting, it is done to ensure any products, equipment and services offered by your franchise meet the franchisor’s specific qualifications and are delivered reliably and at a good price. A ‘soft’ opening marks the first time you open your doors as a fully functional business. This type of event is usually held a day or two before you open to the general public, with a guest list comprising friends and family members (i.e. people who will understand if things aren’t running as smoothly as possible). Soft openings represent a good way to assess any potential weaknesses. It is not realistic to expect everything to run perfectly from day one; a soft opening will allow you to identify and correct any potential issues before you go public. These few days should be treated as a dress rehearsal; your goal should be to simulate a typical busy day. Deal with friends and family as if they were customers off the street and identify any kinks and operational bottlenecks. This will also allow you to isolate any weaknesses among your employees and give you the chance to offer extra assistance or training before your grand opening. After a successful soft opening, you will be ready to open your doors. The grand opening is your opportunity to introduce yourself and your concept to the local community. This is a monumental milestone as it signifies the culmination of all the work involved in opening the business. While national advertising will help promote your brand on a large scale, it is up to you to promote your franchise locally. Your franchisor can recommend effective ways to advertise and market the business to attract local customers, such as a live radio broadcast, prize draw or free sampling. Any money spent on your grand opening is an important investment. The amount you spend will vary depending on the market and type of business. The goal is to attract as much attention to your business as possible. With so many details to attend to, running a new franchised business can be overwhelming. This is especially true during the early stages, when you will see all the dollars going out and no income coming in. While success will not happen overnight, being part of a franchise system will provide you with added resources and extra support during this hectic period. When in doubt, ask questions so you understand the decisions being made; however, part of the value of a franchise is relying on your franchisor’s experience and trusting in its track record. By working with your franchisor, you will avoid costly delays and mistakes and start off on the right foot as you begin life as a franchisee. 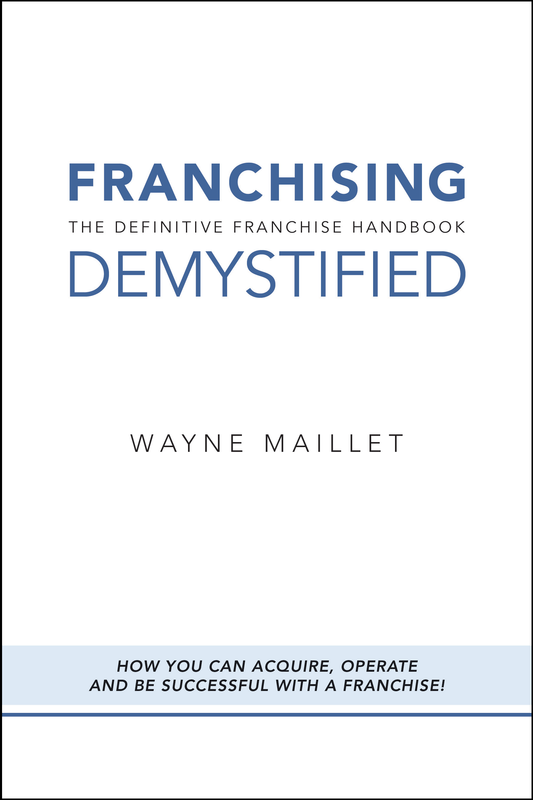 Interview with Wayne on "Stor X"
Wayne Maillet is the founder of 'Franchise Specialists' and the author of 'Franchising Demystified'.